Manga chicks turning the law on it’s ear and dispensing their own formidable form of justice! Sound familiar? 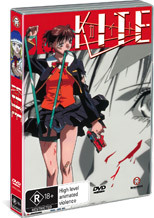 Kite is another tale in that genre about a young girl who orphaned at a young age due to a double homicicide of her parents, is brought up by the detective on the murder case. Raised to kill those whom her “carers” indicate as targets, Sawa finally breaks free of her captors when brought in to assist in a kill with another girl that is being trained. The movie becomes a game of cat and mouse after that point with Sawa and Oburi breaking free and then the pursuit that occurs when you lose the ultimate killing machine. The premise behind the whole tale, whilst done before, is nicely realised and the tale of the girls is well told, keeping you interested for the whole film. Video and audio is excellent and the extras that are light on though and I would have loved to see a bit more. The storyboards and original cells are the best of those on offer, I wish there had been a commentary of some kind to work out what the creators actually thought of the tale as well. Please note the R rating on this title as it is well deserved with a high level of gore and themes. Still highly enjoyable but the warning is there for a reason.